The Cord of Three Strands is a God's Knot original! Couples around the world have been using it to boldly demonstrate God's design for marriage. 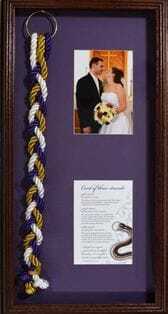 The Cord of Three Strands symbolizes the joining of one man and one woman by God into a marriage relationship. Marriage takes three; you, your soon to be spouse and God. It was God who taught us to love. By keeping Him at the center of your marriage, His love will continue to bind you together as one throughout your marriage. The God's Knot Cord of Three Strands is a great addition to a traditional wedding ceremony. It adds a truly unique element to your ceremony that friends and family will remember. It can also serve as a substitute for the unity candle. This is useful for situations where candles may not be used or may be difficult. The Cord of Three Strands works well as a substitute for outside weddings. During the wedding ceremony, the bride and groom braid the Cord of Three Strands together. The groom holds a small metal ring with three attached strands. The bride then braids the strands together, symbolizing the union of God, husband, and wife. What is the significance of the Colors of the Cords? As a new creation in Christ, the majesty of the Groom is represented in purple. As the husband loves his wife and submits himself to the Lord, the Lord, in turn, will demonstrate His great love in the marriage relationship. Having been cleansed by salvation in Christ, the purity of the Bride is represented in white. As the wife honors her husband and submits herself to the Lord, the Lord, in turn, will nurture and strengthen the marriage relationship.